Designed to protect the end of racking aisles where turning vehicles and equipment can impact vulnerable racking structures. 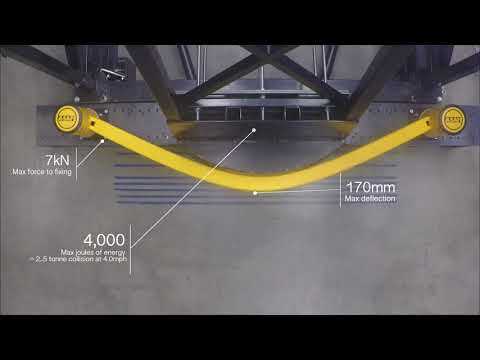 The Single Rail version will absorb and deflect repeated contact from vehicles with lower centres of gravity, preventing damage to racking systems. The circular end posts provide enhanced protection at the barrier ends which are most susceptible to impact. Innovative spinning collars further deflect and dissipate impact forces. Unique patented coupling system dissipates impact forces, preventing damage to floors. MEMAPLEX™ material flexes, absorbs and reforms repeatedly upon impact, preventing the need for replacement. Non-corrosive, non-scratch, non-repaint, water resistant, self-coloured and UV stabilised for minimal maintenance. Impact absorption prevents damage to barriers and vehicles, eliminating downtime and increasing efficiency. Copyright © 2018 A-SAFE. All rights reserved. 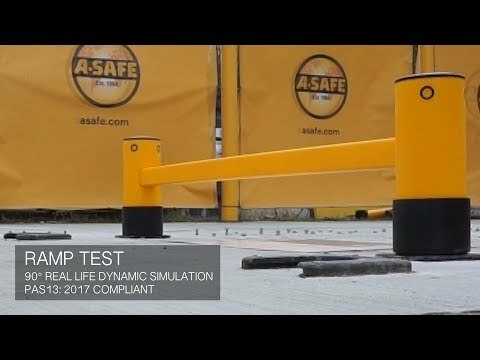 A-SAFE®, Atlas®, eFlex™, FlexiShield™, ForkGuard™, iFlex®, Memaplex®, mFlex™, RackEye™, Protx™, RackGuard™ and SenseSafe™ are either registered trademarks or trademarks of A-SAFE in the UK and/or other countries.